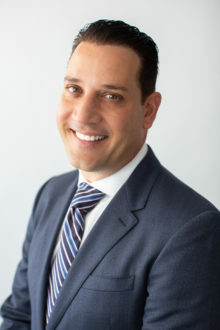 George Stavaris is partner and co-founder of Triniti Partners, Inc., a full-service commercial real estate firm specializing in acquisitions, dispositions and investments of industrial properties in North Los Angeles. As the front line of the company, George works on behalf of his business clients’ acquisition and disposition needs throughout the San Fernando Valley, Santa Clarita and Simi Valley markets. In one of the most highly-regulated markets in the country, George’s background and credentials make him truly unique. In addition to nearly two decades of deal making at large international commercial real estate companies, he simultaneously was a founding member of L.A.’s North Valley Area Planning Commission – and the youngest member to ever serve on that esteemed commission. After being appointed to the commission by then Mayor Richard Riordan, he served three full terms, from 1999 to 2006, and was president of the commission for four of those years. In this capacity, he made determinations on behalf of the City of Los Angeles on zoning changes, conditional use permits, variances and other administrative actions while forging valuable, long-term relationships with the inner circles of decision makers at City Hall. Today, those contacts – and the expertise that comes with being involved on an integral level of decision-making – help his business clients’ acquisition and disposition industrial real estate needs. Whether negotiating complex matters or assisting in entitlement matters for complicated issues, George is able to get things done faster and more efficiently, at times without the expense of an expeditor. Additionally, George brings to his experience in creating private placement memorandums (PPM) and asset management, which is an asset in complex financial real estate transactions. With his early background as a contractor, restoring damaged buildings after the devastating Northridge earthquake, George can determine structural stability and the modification needs of his clients, saving them endless time and effort while helping them find a good fit for their specific needs. Triniti Partners’ average client is a small to mid-size business in the service, manufacturing or distribution area whose requirements are for operating space of up to 250,000 square feet. By working directly with clients, he is able to keep them fully informed at each stage of the transaction, and is always available when needs arise. Prior to his career in commercial real estate, George worked for his family-owned contracting business, Hercules Painting & Decorating, Inc., where he learned the ins and outs of the construction trade. In 1994, after the earthquake caused massive structural damage in the Valley, he co-founded the earthquake restoration contracting firm, RGI Contracting, which won contracts with the Los Angeles Unified School District to repair their facilities throughout the Valley. By 1999, he completed 100+ hours of coursework in Governmental Construction Contracting at George Washington University in D.C., which distinguished him from other contractor-owners. It was at this time, he began transitioning into the world of commercial real estate as an associate at Delphi Business Properties. Over the next ten years, he worked his way up to Senior Associate at Cushman & Wakefield, Vice President at Colliers International, and finally Senior VP at Grubb & Ellis. At each of these firms, he consistently was recognized as a top producer, earning the President’s Circle and many other production awards. He also was appointed to the aforementioned North Valley Area Planning Commission, during this time period, where he was presented with unlimited opportunities to learn state and city standards governing real estate. In 2006, George was profiled in the San Fernando Valley Business Journal’s “40 Under 40” list, after which he became a regular news source for the media on commercial real estate stories. After working as part of large teams at corporate real estate firms, George recognized that the niche market of small to mid-size business was not being properly serviced, and decided to go out on his own to form Triniti Partners. His efforts, today, are geared to improving the commercial real estate environment in Los Angeles by setting the bar higher in both the service and customer attention provided. George serves as chairman of the board for the San Fernando Valley Financial Development Corporation, a non-profit bank and arm of the SBA that lends money to businesses for working capital and real estate loans. He is also a member of ProVisors, Sherman Oaks 1, and a former board member of the Valley Industry and Commerce Association (VICA), where he chaired the Local Issues Committee from 2000- 2007. On a personal note, George is married with children and enjoys competitively racing motocross.